AGILE (Environment for Linear and non-linear Image reconstruction using GPU Acceleration) is an open source library for GPU accelerated reconstruction problems in medical imaging. It includes reconstruction code for Magnetic Resonance Imaging (Figure 1) and Fluorescence Tomography (Figure 2), and was developed and tested on Linux systems. If you are interested in our MR image reconstruction algorithms but don't want to use a GPU implementation, the newest release of AGILE now also includes a C++ CPU implementation. We also have Matlab code available. Please contact us if you are interested in it, then we can send it to you. 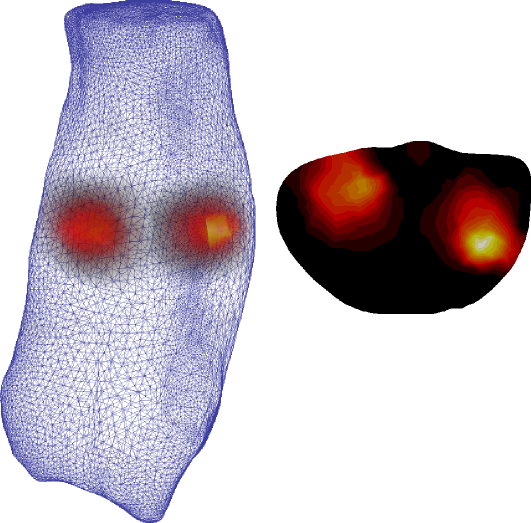 Figure 1: Reconstruction of undersampled radial data from 48, and 32 radial spokes (256x256 matrix). 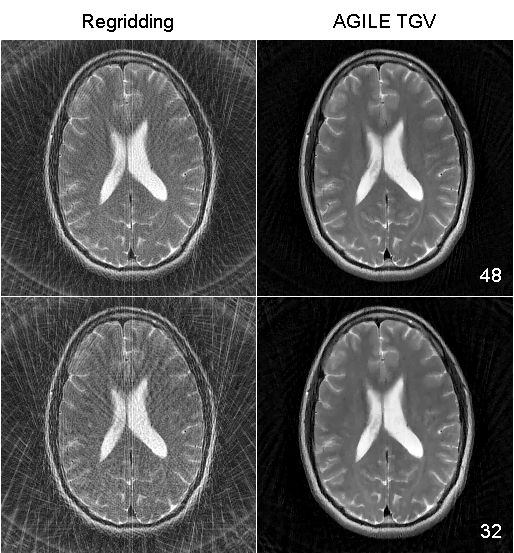 Conventional regridding reconstruction (Top row) and AGILE iterative TGV image reconstruction (bottom row). The corresponding reconstruction times on an NVIDIA GTX 480 were 8.76s (48 spokes) and 6.36s (32 spokes). Figure 2: Fluorescence Tomography reconstruction performed on a NVIDIA GTX 480. Reconstruction time: 24 sec (speedup-factor of 13). 1.11: 13.04.2012: Minor changes in documentation and readme. 1.1: 16.01.2012: Included CPU reference implementation for TGV. 1.0: 28.07.2011: First release of AGILE. If you use this library or the provided data in your publications, please cite: Freiberger, M.; Knoll, F.; Bredies, K.; Scharfetter, H.; Stollberger, R.: The AGILE library for image reconstruction in biomedical sciences using graphics card hardware acceleration: Computing in science & engineering (2012), in Press. For any questions, comments or contributions, please contact Florian Knoll.